EU Council President Tusk, President Elbegdorj, and others spoke out against the violence and pledged unity. As the 11th Asia-Europe Meeting Summit concluded in Ulaanbaatar on Saturday, a number of leaders expressed their thoughts on the attempted coup in Turkey and the terror attacks in Nice. EU Council President Donald Tusk called the Summit “unforgettable” due to the events that unfolded elsewhere over the two-day period, but said Mongolia did an “excellent job” hosting. Tusk called for “a swift return to constitutional law” in Turkey and that “the EU attaches great importance” to a peaceful resolution of the conflict, which he said was not yet over. In his concluding statement Mongolian President Tsakhiagiin Elbegdorj expressed unity with the people of France and Europe, particularly the victims and family members of the attack in Nice on July 14, which left 84 dead and hundreds of others wounded. Prime Minister of Slovakia Robert Fico, who also spoke at the press conference, said that these were “fragile and turbulent times” and that terrorist incidents are not isolated events but something on which the international community must cooperate. The delegates released a joint statement denouncing the attacks in Nice as “heinous and cowardly” and reiterating their “strong unequivocal condemnation of terrorism in all its forms and manifestations committed by whomever, wherever and for whatever purposes. The “very sad news of the killings and attacks” of the last couple days had left the leaders of Europe and Asia prepared to “stand together” against violence, said Elbegdorj. The presidents of Bulgaria, Croatia, Cyprus, the Czech Republic, Latvia, Myanmar, South Korea, and Switzerland were among the 10 heads of state in attendance. Delegates from over 51 countries, as well as the EU and ASEAN, traveled to the Mongolian capital for the Summit. Security issues were a major theme and a separate topic of discussion was Tuesday’s ruling by the Permanent Court of Arbitration in The Hague that China’s claims on the disputed waters and territories in the South China Sea are without merit. 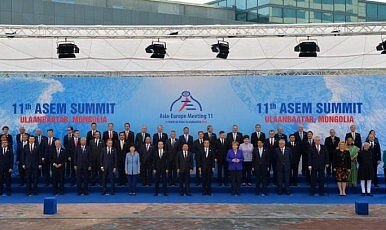 The 11th Asia-Europe Meeting was the first major international conference following The Hague’s verdict. At ASEM, Philippine Foreign Affairs Secretary Perfecto Yasay called on all parties to exercise restraint regarding the matter but affirmed his country’s respect for the UN-backed tribunal and its ruling. He urged for a peaceful resolution to the matter. Nonetheless, Japan’s Prime Minister, Shinzo Abe said that he strongly hopes “the parties to the dispute comply with the award and lead to a peaceful solution of the dispute in South China Sea.” Abe made the comments on Friday at a retreat outside of Ulaanbaatar. Today at the press conference, Tusk said that “it’s not easy to agree” with China over their disregard of the UN-backed court’s ruling, but that its perspective must be respected in order to reach a satisfactory settlement to the long-standing dispute. All four foreign speakers at the final press event spoke warmly of Mongolia’s graciousness in its role as host. Elbegdorj said that Mongolia wanted to present its “culture and celebrations” and that he was pleased that the guests enjoyed the food and hospitality. Elbegdorj presented ceremonial horses as gifts to the top delegates on Friday, a traditional offering to world leaders. Before many people knew of Mongolia as a large country, but “now they know it’s a destination,” said Juncker. Security issues were at the fore in Ulaanbaatar, but Mongolia shone as a host to the delegates.